Champagne Rack Inspiration! A very dear customer bought one of our original riddling racks from the Champagne region in France and did this!!! Take a look at the stunning effect they produced, the industrial bulbs and shadows give an amazing affect. This was done using half an A frame at £125. 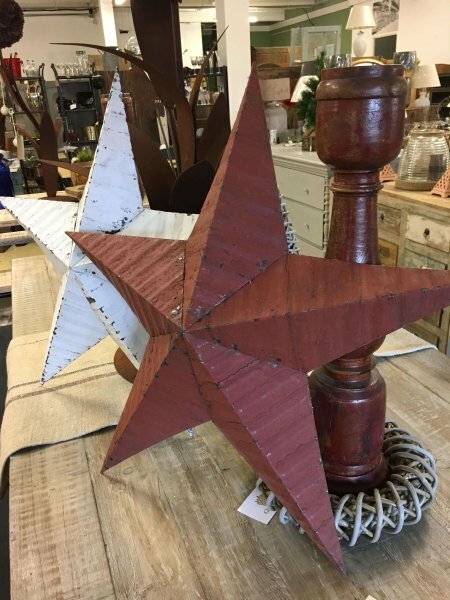 Amish Barn Stars from our online page Click here to shop now These are authentic barn stars from America. A real favourite of ours. Made from reclaimed metal barn roofing. Hand painted. 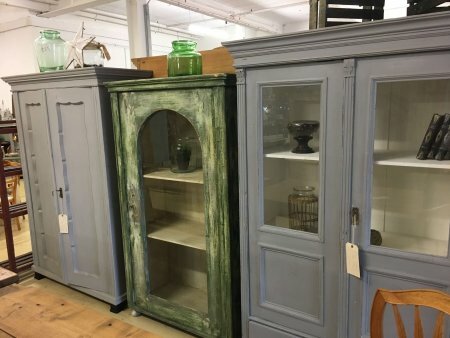 The paint is rustic and flaky in places giving a wonderful patina and vintage look. The significance of colour- Red – Emotions, passion, charisma, lust and creativity. White – Purity, power of the moon, allows energy to flow freely. Blue – Protection, peace, calmness and spirituality. Green – Growth, fertility, success in things and ideas that grow. We have the most popular colours of red and white in stock most of the time. The other colours are not readily available all the time. Barn Stars were originally carved directly into the barn, but were later made from wood, as a separate piece, and metal. Gift ideas at arkvintage. Lots of gorgeous finds in store. Get inspired and buy them something thats not just “same old”!! As always we have huge stocks of furniture that will inspire, and can be delivered before Christmas! Dining Tables Delivered Before Christmas. We have lots of different designs and sizes in stock that can be delivered in time for the festive season! A frame dining table, 7 foot. Industrial metal base table. Steel base dark wax base dining table with dark waxed reclaimed pine top. Available in different sizes. Industrial style table, with a box steel bas and beautiful chunky oak top. Vintage style dining table, with a chunky thick reclaimed Check for availability via contact page, if you send a post code we can quote for delivery too.Click here for contact page Arkvintage has a huge and ever-changing array of vintage, antique, retro and quirky discoveries.You can also follow our FB page here @arkvintagecamberleyWelcome to Ark Vintage. 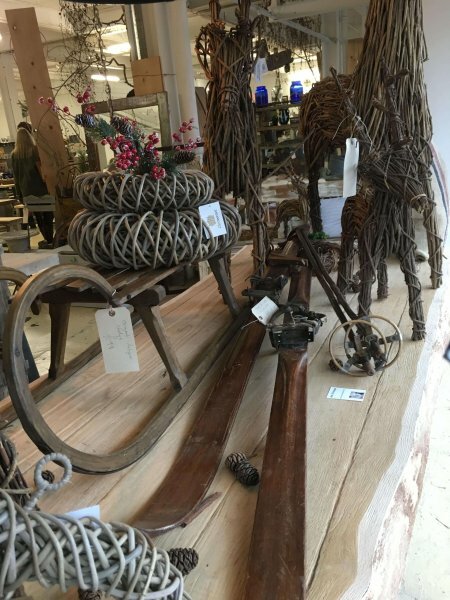 The home to an eclectic mix of beautiful vintage, industrial and retro furniture, lighting and quirky finds from across the UK and Europe.We are the largest vintage market style shop in Surrey. Positioned near the border of Hampshire and Berkshire, (40 minutes from London). 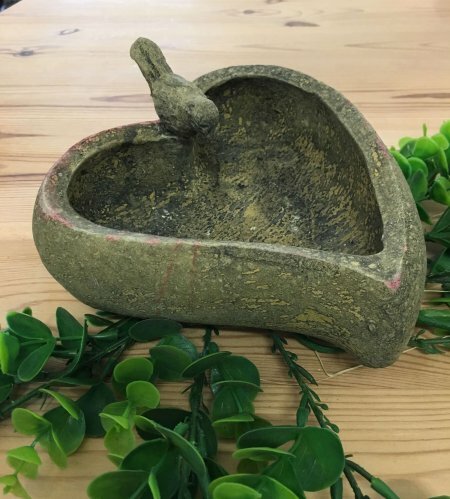 At Ark Vintage you will always find an ever changing, mix of vintage, industrial and retro discoveries for the home and garden. We guarantee great service from the Ark team- winners of the Best Business in Camberley and Customer Service Awards. 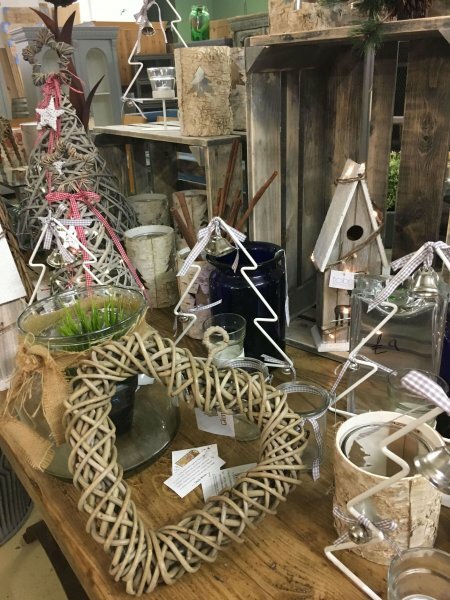 Christmas at arkvintage, we have lots of reindeer wreaths and hearts along with beautiful finds and decorations not found in main stream stores! 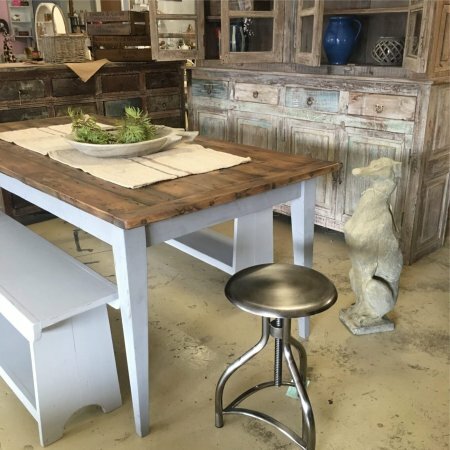 Don’t forget as always we have large stocks of furniture and accessories with our wide table range always popular! Vintage skis sledges, just arrived at arkvintage in Camberley. Beautiful original finds from the alps in Europe. Gives Christmas an authentic vintage feel. 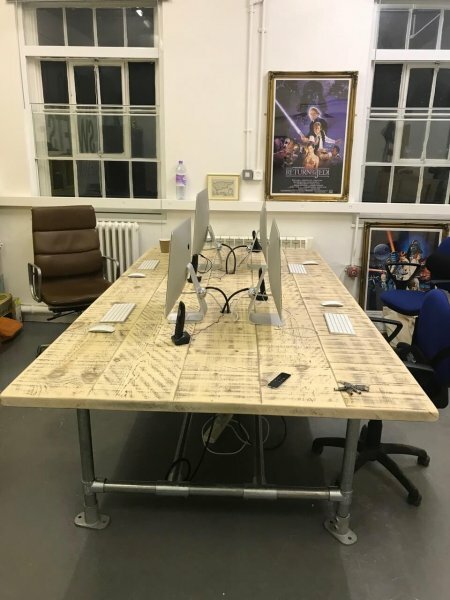 Bespoke desk top, from arkvintage.com. 2.7m x 1.4m with holes for cables etc. Beautiful industrial look, with practicality thrown in! Made from reclaimed timer and sealed with a matt varnish. Delivered to a London office. Job done and a very happy customer! Check for lead times via contact page, if you send a post code we can quote for delivery too. 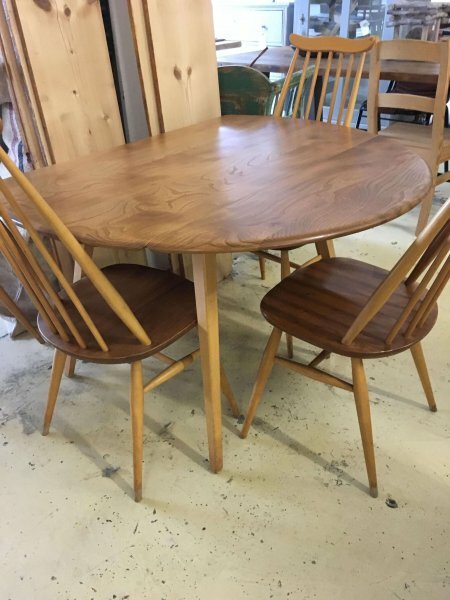 Ercol Table and chairs. Just arrived as new condition when bought in the 1970s! 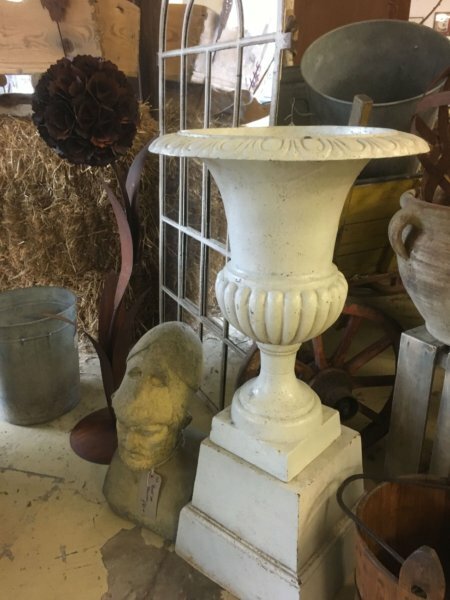 Cast Iron urns with a great vintage look, for the garden or indoors interiors. White, aged rustic paint. Will age and rust more if placed out doors. SALE 20% off on last 2 remaining now £176 each. However, contact us or fill in contact form for a delivery quote. Sign up for news and weekly offers.